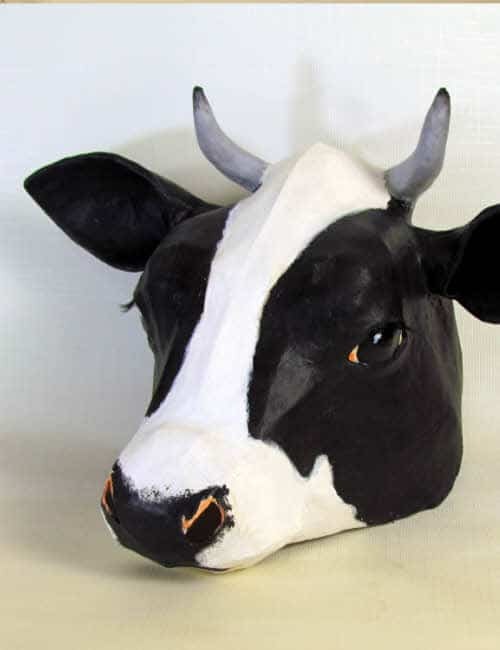 Wear your cow mask to a party or in a play, and then use it as wall art – it makes a great addition to your decor. 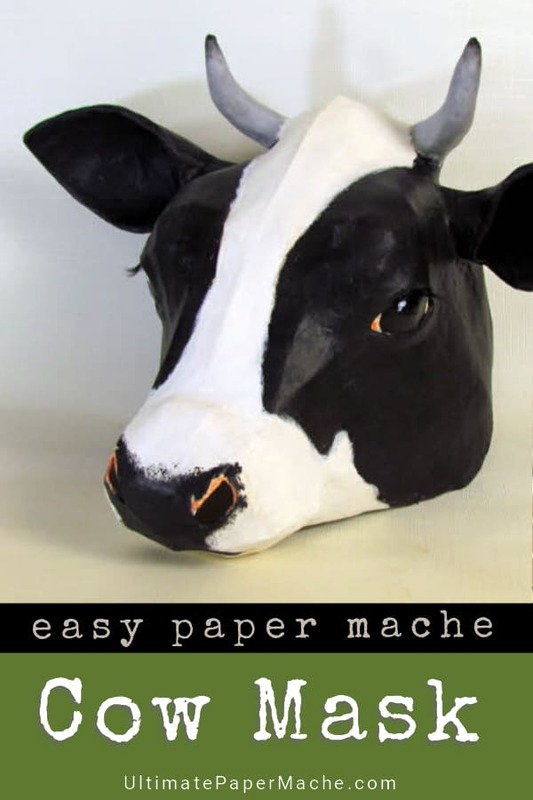 You’ll use 1 1/2 cereal boxes and a few scraps of cardboard from a shipping box to create your cow. Just print the pattern and put it on your cardboard. 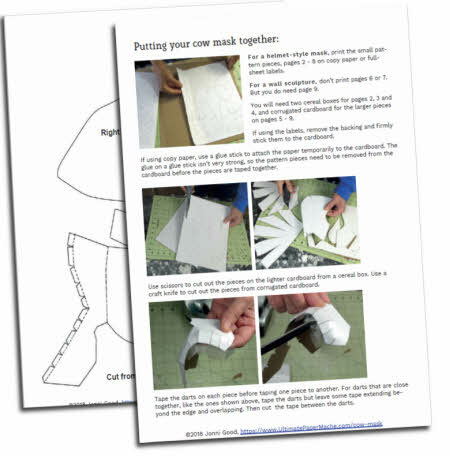 Then cut out all the pieces and tape them together, following the detailed instructions that come with your downloadable pattern (PDF). 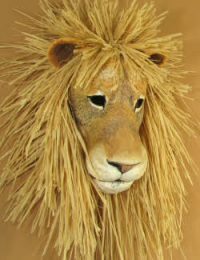 Cover the assembled cardboard pattern with just one layer of paper mache. (See the second video below). 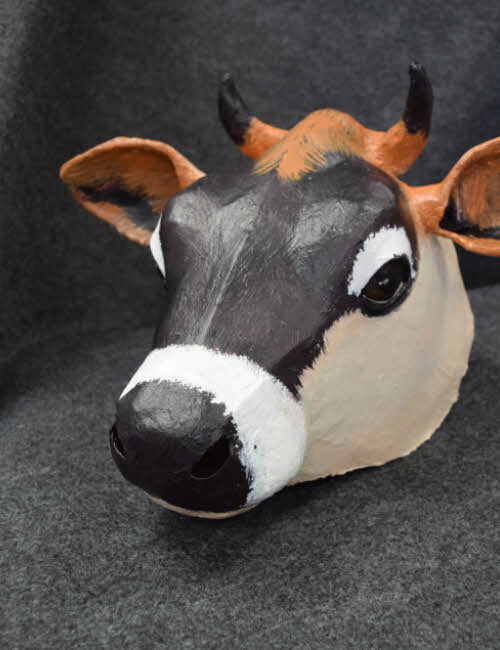 Then paint your cow, using the colors and spots of your favorite breed of cow for your model. Finished size: About 8 inches (20 cm) high, 15.5 inches (39 cm) wide and 12 inches (30 cm) deep for the wearable helmet-style mask or 10 inches (25 cm) deep for the wall sculpture. Corrugated cardboard from shipping boxes. There are two ways to contact me: The fastest way to get an answer is to leave a comment below. I read all comments and answer them as soon as I can, usually within a few hours. One of my readers might also chime in to help – we have a very supportive community here on this site. I get a ton of spam and I don’t want your email to get lost, so please put “paper mache” in the subject line. Comments don’t get accidentally deleted, but emails sometimes do. If you don’t hear back from me within 24 hours, assume the cyberspace gremlins ate your email, and try again. I need some help actually. 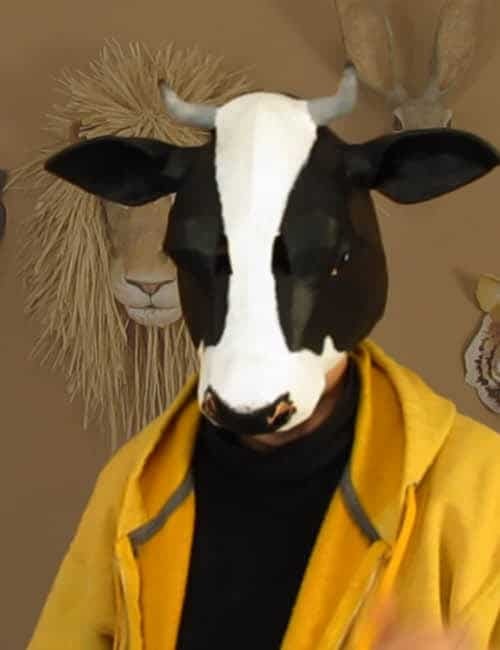 I’m using the Elmer’s art paste that you showed us in your video since I can’t use flour.I mixed it with water and waited 15 minutes like the instructions say and like you showed, but after using it to apply the newspaper strips to the inside of the cow mask and giving it some time to dry, I’m noticing that it is not drying like paper mache, it looks more as if i just used regular glue and glued newspaper to the inside of the cardboard structure. Did I do something wrong? Honestly, this is my first time using paper mache since I didn’t know of any flour free recipes prior to this. I’ve worked with plaster strips on clay, however, and this is not hardening like that at all or like how I imagine it’s supposed to. Any ideas on what I could have done wrong or how to fix it? Hi Victoria. I’m not sure what could be going wrong. 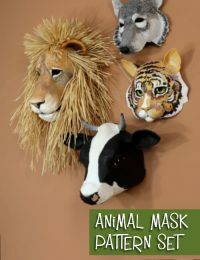 I used just four layers of paper for my African mask and the Elmer’s Art Paste, with no cardboard at all, and it turned out to be surprisingly strong. It does dry clear, like glue. Is it possible that it just hasn’t had time to dry yet? 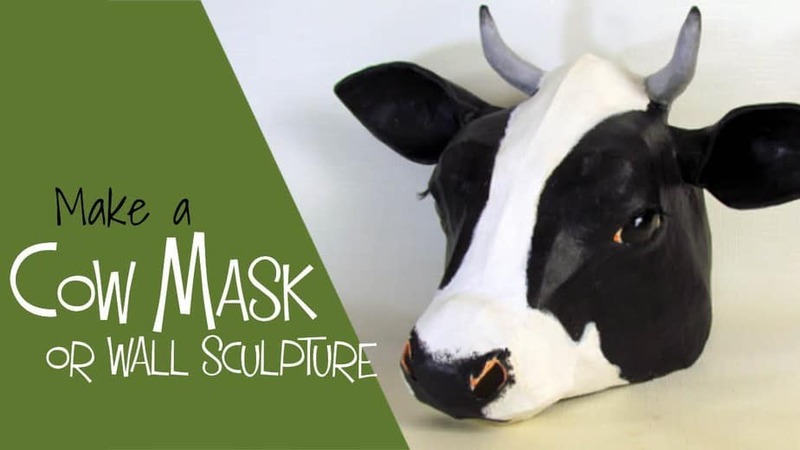 If you add a layer of paper mache to the front of your cow, and it still doesn’t seem to be working right, let us know – maybe one of our other readers can help us find a solution. You really did outstanding work on this piece. Very, very true to form. Great Work!!! 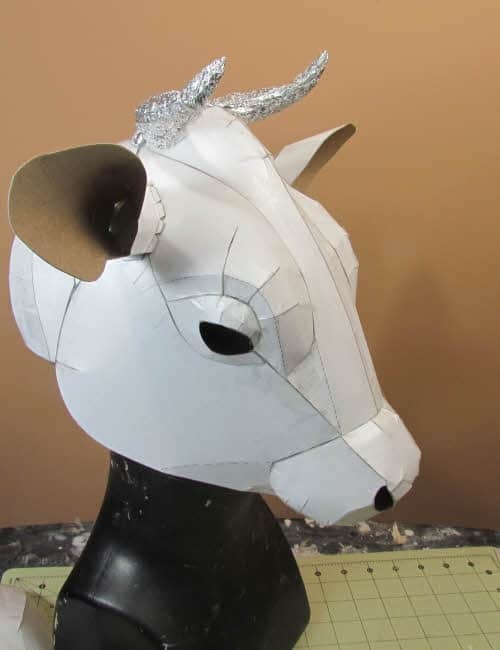 I haven’t gone back to completing my horse head mount, due to losing sight in the one eye I had cataract surgery on last year…but am determined to complete it, nevertheless. When I do, you’ve given me the the idea to use false eyelashes on my girl. Good idea! Thank You. Thanks, Sharon. But I’m so sorry you’re having problems with your sight. Is there any way for the docs to reverse the damage? I seem to remember your horse very close to finished the last time we saw it, but my brain sometimes makes stuff up. Do you have much work left to do? Thank you Jonni for your kind thoughts. As to your question regarding the doctors, I was sent to 3. The 1st one, the surgeon who removed the cataract and replaced the lens, had a conniption fit in the office,then referred me to a Specialist, who then advised me to take his results to my physician telling me “who would know what to do”… my doctor then did a biopsy to determine if the loss of sight in that eye, was an eye disease which would eventually move to the other eye and cause blindness in it as well, which it wasn’t, that disease she tested for. Then she told me that there was a controversy as to whether or not, eye lens replacement during cataract surgery can and does cause this. That was it, facing the uncertain decision I have to make about doing my other eye, which my “doc” told me needed to be done. Anyway, long story here which has taken a longer time to write due to my vision…but I AM going to finish my girl….it’s just taking longer than I could have ever thought when I started her. I’m so sorry you had to go through all that, Sharon. We all hope you can get back to sculpting soon. That cow is so sweet. The eyes say it all and I think lashes are very important. When I do lashes, I unravel sisal twine and line up the separate strands and cut to look like lashes. I then use a piece of masking tape and tape it to the sisal lashes the long way, only halfway in. Then I tape that piece to the paper mâché sculpture, add paper mâché, etc. I bet you have a better way. I haven’t checked out your video so I don’t know. I must say your pieces are so refined and you can tell that you love animals. It shows in your work. It is truly inspiring. Hi Patricia. 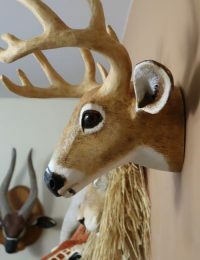 Using sisal twine for lashes is an excellent idea! I just bought some fake eyelashes at Walmart. 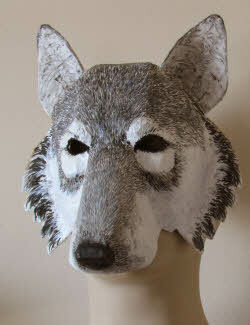 They’re adorable when you can see the mask up close, but if it was used for a play, they’re much too fine to be seen. Your idea would work much better. Thanks!